The program can have predefined case tasks which then can be rescheduled for multiple future dates. We provide you with a demo of the product that is free to use for up to seven days. This product can be converted into the full product by a simple registration process. A simple registration payment process will get you up and running with the full version of our product. Our product has increased efficiency at many firms. 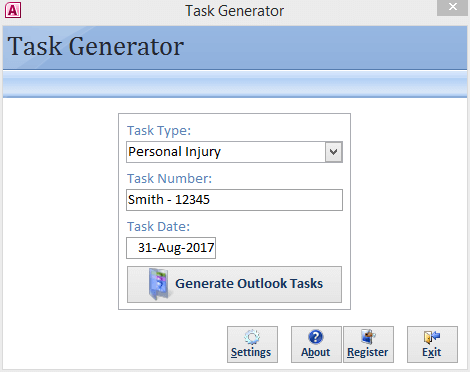 See what others are saying about TaskGenerator! Site Contents © 2019 - TaskGenerator. Site Design & Development © 2019 - Eclipse Computing Ltd.